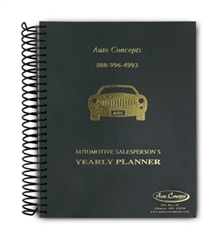 Designed by sales managers utilizing years of experience to make your sales force the most productive ever. A tool designed for salespersons to help build prospecting base, track monthly sales, measure sales performance, and improve sales skills. Goals & Improvements Start each month by reviewing last month’s goals and then set new ones. Mark areas for improvement based on last months’s performance. Monthly Sales Performance & Income Monthly summary allows each sales person to determine total contacts and closing ratios. Also, use this page to determine deal average and monthly income. 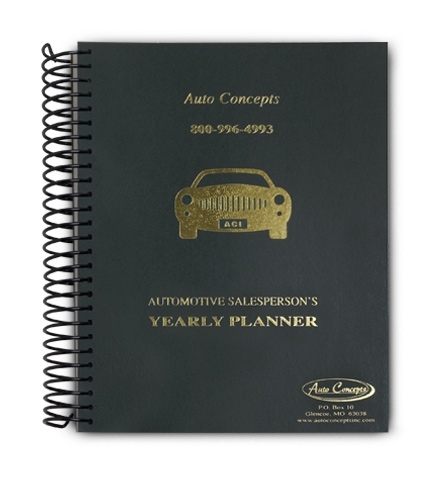 Permanent Owner Files Record information on all sales for the month. With all the information in one location it’s perfect for follow up. Holds up to 32 sales each month.